Next on the tour, we finally make it to the basement, which hardly feels like a basement because of this large double window looking right out across the back yard. I have a feeling our cats are going to love it. 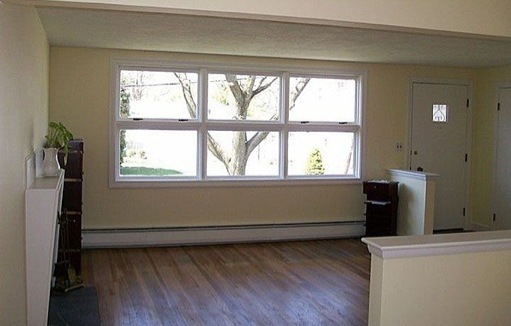 The basement is the full size of the living room, kitchen and dining room combined, so it’s quite roomy. 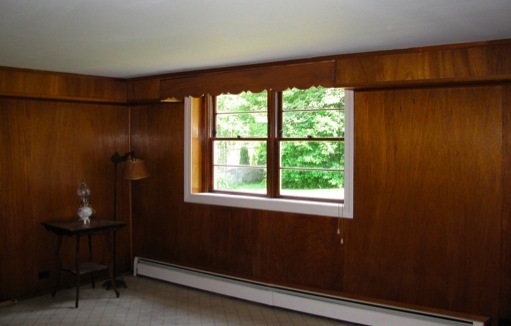 There is a mechanical closet in one corner, the oil tank in another, and yes, the whole thing is encased in what Greg thinks is beautiful panelling. I myself will have no problem painting it or ripping it down someday. But, regardless, I am thrilled to have a second living space aside from the living room. 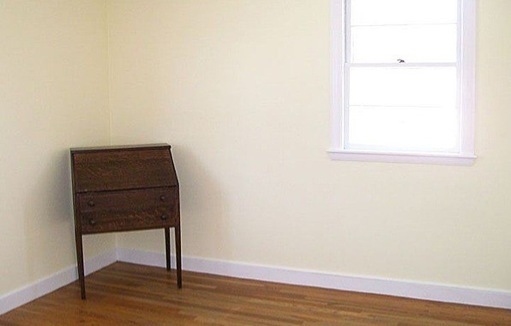 We plan to fill it for the time being with hand-me-down sofas from my mom. Refreshing the walls and the floors will make a huge difference. And of course, we plan to convert from oil to gas at some point, so removing the oil tank will add back a lot more space to the room. 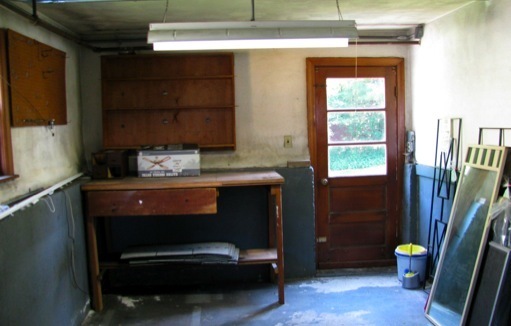 Another great feature of the house is the garage. An attached garage. It seems to be a rarity around here, especially in our price range. It’s only one car, but I’ll take it! My car is small! And, as you can see, there is room at the far end for a shop. The door leads to the back yard. 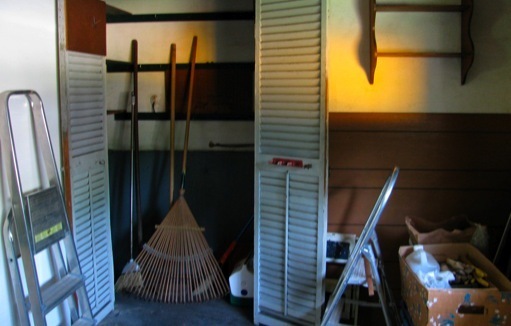 When you enter the house from the garage, you can go straight down into the basement, into the half bath/laundry room, or up a half flight to the kitchen. Shouldn't be too bad for bringing in groceries. There is a storage area on the side of the garage. This closet is directly below the closet in the bedroom which notches around the coat closet. It’s pretty cool that there is no wasted space. I have been getting a lot of comments so far about the great light this house has. The garage and the basement seem to be no exception. And then of course, there is the great yard, which we will visit next time. The basement is amazing! The window is just lovely. I love that the garage is bright, too. Will we get to see the bathrooms and stairways on the next tour, as well as the yard? This house is really special! To continue the tour, (I’ve managed to supplement with some shots Greg took)...there are three bedrooms in the house. Three real bedrooms. With real closets. Not a half of a living room on the main room pretending to be a third bedroom like many of the capes that are so common around here. And the master bedroom is enormous. From the outside of the house, it is quite deceiving, because it is so efficiently tucked in above the living room. Yes, it does have sloped ceilings like many a cape, but it is huge! Room for a king sized bed if we can ever manage to get one. And the best part is the storage. 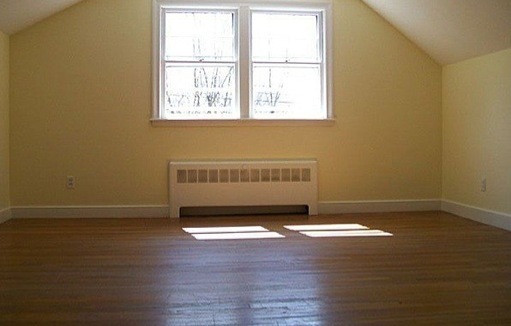 Accessed through one of the master closets, you can get to the attic above the two other bedrooms. In addition to that, there is a space which runs along the entire eaves on the left side of the picture. It will be possible to add a dormer in the future in order to add a master bath and bigger closet. Yet another project for the 5 or more year plan. This house will definitely be our new hobby. The other two bedrooms are side by side a half-level up from the living room. The one in the front (above) is a bit larger, and has a nice double window facing the street. 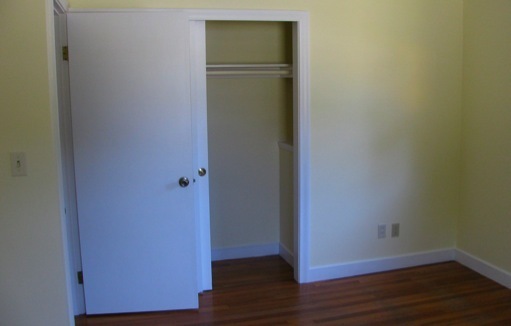 The closet is a decent size, and has a portion that stacks above the coat closet in the living room below. You can just see it on the right of the closet opening below. We may consider opening that up to be more accessible storage. The smaller bedroom (below) faces the side and back yards. It might be a bit smaller, but it boasts the biggest closet in the house, running the full length of one wall. The last room on this floor, which we have yet to photograph, is a lovely pink full bathroom. I guess we won’t miss the one we are leaving behind! Next time, we’ll visit the garage, basement, and maybe even the yard. Wow! More natural light! And you are right... that Master *is* big! YAY! So awesome to have all that space and REAL closets!!!! You'll be living there soon!!!! I LOVE it!!! It has all the charm and character you always wanted. Can't wait for Paart 3. I promised some real pictures of the house. The thing is, we were relying a lot on the ones posted on the MLS, so, we haven’t taken many good shots of our own yet. We’ve mostly been concerned with details. Well, it seems that it’s not possible to access the MLS shots anymore. Luckily, there are still a handful of photos left on Zill*w, so this is where we will begin our tour. Above, you can see that our new house is a lovely blue split-level with a bright red door. It’s on the corner of a main road, but the front faces a lovely tree-lined side street. The front of the house faces west. There are 5 half-floors to the house. In this picture, you can see the garage, the living room and one of the bedrooms, each separated by a half level, facing out the front of the house. The other two levels contain the basement (below the living room) and the master bedroom (above the living room). This is from the dining room, looking back toward the front door and the incredible 10 foot wide window, which faces out to the front yard. 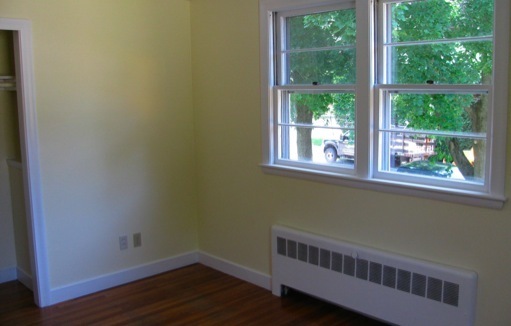 There is a small fireplace at the left, and a coat closet to the right of the front door. You can make out a bit of the fading and damage to the floor we hope to have repaired, just to the left of the half-wall at the front door. Now, we are standing in the living room, in front of the fireplace, looking into the dining room. The door here goes out to the back yard, We hope someday it will open on to a deck. One of the things we love most about this house is the open living area. 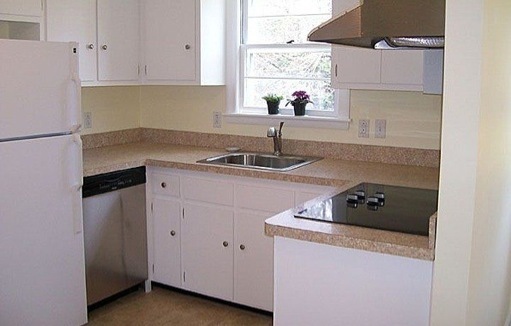 You can catch a glimpse into the kitchen in the top left, just over another half-wall. Finally, tonight, we visit the kitchen. It is small, but efficient. And never fear, we have a kitchen designer in the family (Greg’s mom, Gina) who has already investigated many ways we could improve it. That’s probably part of the five-year plan though. For now, we will enjoy many new appliances, and a few that appear to be original (more on appliances in another post, since these are some of the details we’ve photographed already). Next stop on the tour, the bedrooms...stay tuned! 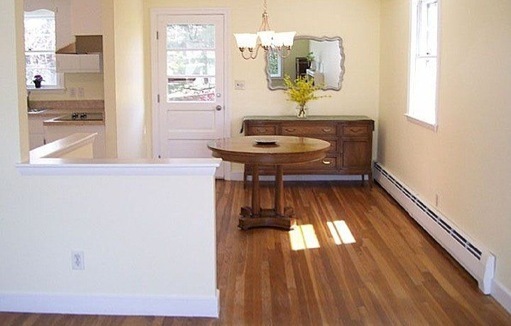 I love that the house is so bright and cheerful! I love the wonderful windows and the open feeling. I am still amazed you found this incredible abode in Waltham! Can't wait to see more! It's fabulous!! I love all the natural light in there.... and the kitchen is perfect for now. (You'll want a year in it to see how you function anyway. Right?!) LOVE IT!!!! PS - Is that a fenced backyard?! It looks great Jen!!! Thanks for sharing pics! There is a lot to coordinate when buying a house and moving. Especially since we want to make a few improvements in the few weeks we will overlap with our current home. Greg made an enormous calendar to keep track of it all. Wow... we were nowhere near this organized! In order to move, you need a lot of boxes. I got some from work, and then Greg started adding to the collection. This is all before he opening up our eaves storage and discovered that almost all the boxes from our previous move are still there. 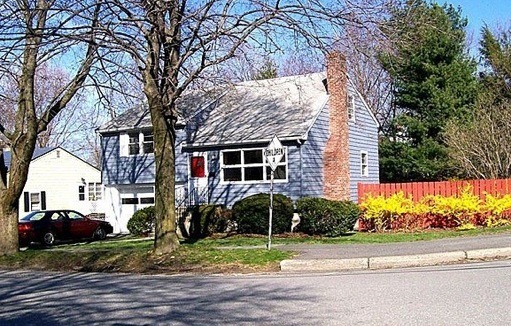 It’s been a long road since we decided to sell Greg’s house in Wilmington just over three years ago. Tonight, we got to visit our soon to be new house to meet with some contractors to get estimates on refinishing the floors and replacing the windows. It was exciting to see the “Sale Pending” sign out front. I remember that feeling of driving by our house and seeing the "Sale Pending" sign, too -- its a GREAT feeling!!!! Very cool to see that Greg's truck fits so nicely in the driveway, too! Loved all the pictures -- can't wait for the housewarming!! !